Tricycles are a great way for toddlers to explore the world around them. However, neighborhood sidewalks aren’t usually the safest place for small kids and their tricycles. Driveways in front of our homes don’t often give kids enough space to discover either. Even if you are lucky enough to have sidewalks and driveways that are relatively obstacle-free and spacious, the harsh concrete surfaces inevitably lead to scraped knees, painful “road rashes”, and bruised egos. 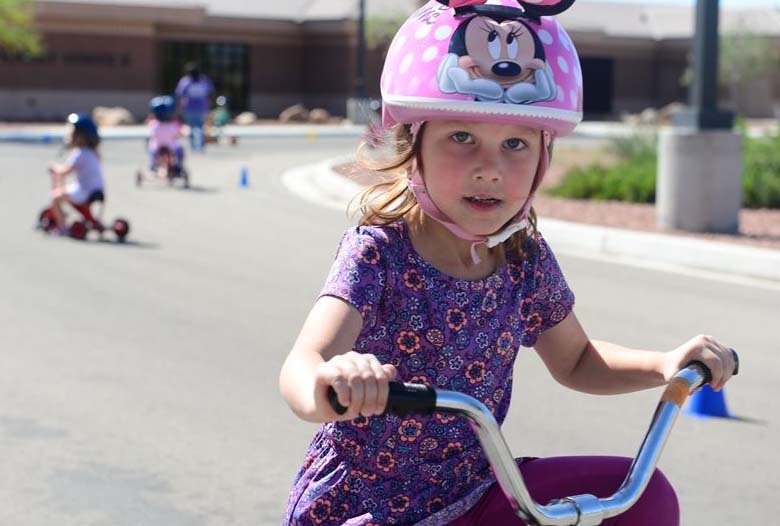 Kids need a safe place to learn the “rules of the road.” Bike playgrounds have been popular in Europe for years and are becoming more and more common here in the States. But what about something for younger kids on tricycles? Don’t forget to include them when you’re planning a playground, park, or play area. Kids on three wheels need their own space to learn how to ride. They need a designated space where parents can keep an eye on them while they explore, build self-confidence, and work off some of their seemingly inexhaustible reservoirs of energy. 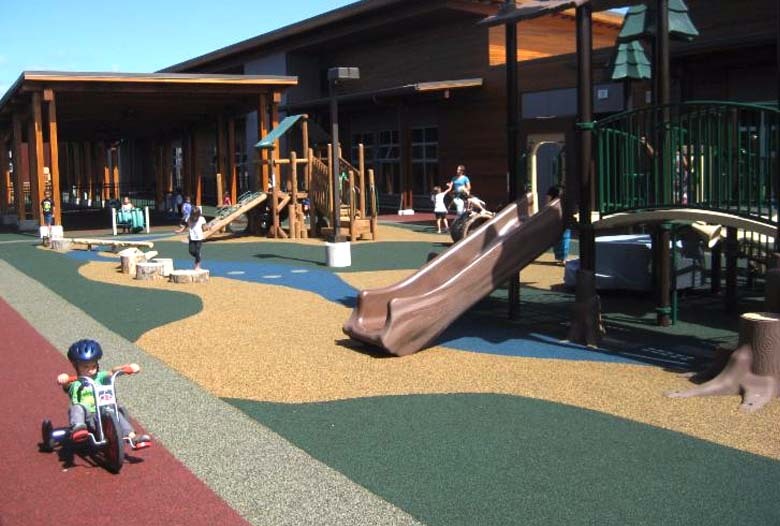 No Fault Sport Group has durable, cushioned, permeable, slip-resistant poured-in-place (PIP) rubber surfacing that is ideal for city parks and school playgrounds. Playground designers love to use it for trike paths around play areas. These tracks typically are a simple PIP pathway colored differently from the surrounding surfacing material. They give kids an easy-to-follow “road” that keeps them from running into the other children on nearby playground equipment. Our No Fault Safety Surface is a seamless “unitary” surfacing that is ADA accessible. Tricycles can move easily over the surface, unlike with gravel, sand, or mulch. Because it is a unitary surface, PIP does not move or shift around. No Fault Safety Surface also comes in different thicknesses, depending on the maximum critical fall height you need. This gives you the utmost safety for all the kids you are responsible for. Cleanup usually takes little more than a leaf blower, though an occasional hose-down will keep it looking good as new. Our safety surfacing even gives you a wide range of color, design, and theme options. See No Fault Trike Paths In Action! Ready to see the trike paths we’ve built? No Fault Sport Group teamed up with Allplay Systems to create a beautiful “natural forest” themed playground in Tulalip, Washington. This unique playground features a tree fort, trike paths, wood cabins, stepping stones, hollow “logs”, and animal benches. We installed more than 21,000 square feet of No Fault Safety Surface in green, tan, and blue (representing soil, grass, trees, and flowing rivers). We typically install our PIP rubber surface in colored “rings” around the playground equipment area–still on the playground but in a space designated for little tykes on their little trikes. 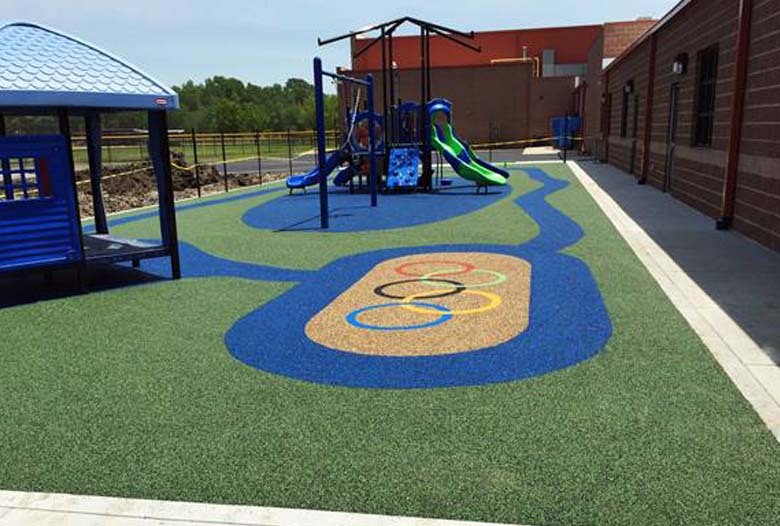 For another project, No Fault Sport Group and All Inclusive Rec teamed up to install 4,000 square feet of No Fault Safety Surface at The Jackie Joyner Kersee Center in East St. Louis, Illinois. Stunning shades of green, tan, and blue were matched with the Little Tikes play equipment. Colorful Olympic rings were incorporated into the rubber surfacing along with a trike path (the blue ring around the larger play structure in the photo below). Whether you’re planning a playground, jogging track, or trike path, No Fault offers coast-to-coast installation service to give you reliable quality. You can be sure our poured-in-place rubber surfacing will be versatile, durable, and attractive for years to come. The staff at No Fault would like to help you incorporate a trike path into your next project; contact us today and let’s talk! I am looking at options for a trike path in my backyard, can you give me an estimate for a path that is 90 feet long by 3 feet wide?